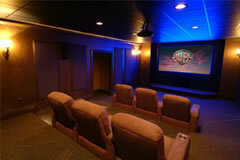 There is more to Home Theater than simply selecting high quality equipment. Our home theater designers will help you to create a quality custom home theater using the best equipment possible within your budget. At Advanced Home Control's our experienced designers can help you create a system with quality components in an environment that is also acoustically and cosmetically appealing. Our design services include Custom Design & Layout, Framing, Acoustic Treatments, Sound Isolation, ISF Video Calibration, Audio Calibration, and Custom Theater Seating. Whether you are a great do-it-yourselfer or a complete novice with a large amount of cash to work with, the best way to get the most out of your custom built home theater is to either pay a licensed contractor that also does home theater construction or a licensed home theater installer that does construction. The best way to evaluate the full potential of your room, is to have someone knowledgeable in the field actually come in, assess the environment in person, and take note of any good points and bad points, as well as suggesting options on where to place your components for maximum benefit and ease of use. In addition, you will get a much more accurate budget picture of the whole project as the installer/contractor will not overlook small details that you may have overlooked, that could end up being significant. 1. What will be the primary purpose of the room? - To Watch movies and TV, listen to music, play video games, use as an office as well as entertainment? 2. The size of the room. 3. The shape of the room. 4. Where you or your audience will sit in relation to the TV or projection screen. 5. Acoustical properties of the room. 6. Ambient light issues that may affect the type of TV or video projector to be used. 7. Whether a projection system or large screen television will work best. 8. Whether In-wall or standalone speakers would be most effective for the listening experience. 9. Where your components will be located - out in the open, or in a closet or booth. 10. Room Ventilation for both the viewers and home theater and other media components. These, and other, factors can be determined best by an on-site inspection of the actual room or by looking at architectural plans for a home to be constructed with home theater in mind.